The term fuwa fuwa is Japanese for fluffy. I've described before how much texture matters to Chinese cuisine, and one particular food texture is prized in East Asian cooking is the sensation of fuwa fuwa. Particularly in bread and cake. While the bowl of rice may be emblematic of the cuisine of China and Japan, quite a few bread products are eaten there as well. Baking, however, in dry heat, is a recent incorporation. Most often, breads are steamed. Perhaps the best known are the bao, where bread dough is wrapped around some kind of filling, be it seasoned roasted pork (char siu), or red bean paste. Incarnations of the steamed bao have migrated around the world, evolving into the Filipino siopao, and the Hawaiian manapua, incorporating fillings sweet, savory and everything in between. But what about the bread itself? 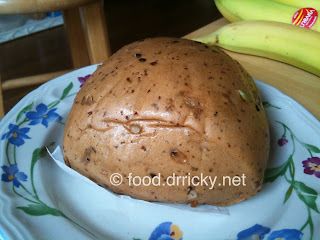 Sans filling, the bread is called a mantou. This version from the Six Ping bakery in Houston incorporates dried fruits, nuts and seeds to make a multitextural affair that I find actually works well toasted and topped with cheese. Steamed bread can also be filled with stewed pork belly and peanuts to make cua pao, a highly lauded version of which is served in David Chang's restaurant Momofuku. In his cookbook, relates the search for recipe of the steamed bread, only to find that it really isn't too different from standard white bread, just that steaming changes the nature, from bland to fuwa fuwa.